In cautious increments, nuclear archrivals Pakistan and Indiahave been easing the pall of tension that has overshadowed the two nations in recent years, as Islamabad increasingly worries about another neighbor: volatile Afghanistan. The latest move toward rapprochement came last week, when the Pakistani Cabinet announced it would normalize trade relations with India by granting its longtime foe “most favored nation” status. The designation has practical ramifications, including the elimination of discriminatory pricing and mutual imposition of lower tariffs and high import quotas. More important, however, it marks the latest in a series of decisions and events that signals a warming in relations between two countries that have fought three wars since their independence after the 1947 partition of British India. Driving the move toward improved relations with India is Pakistan’s belief that strained ties with traditional allies such as the U.S. and Afghanistan are leaving it increasingly isolated, analysts say. India and Afghanistan signed a strategic partnership pact last month that included the training of Afghan troops by Indian forces — a move that rankled Islamabad. The steps between the two South Asian neighbors have been small yet striking. After an Indian military helicopter flying in bad weather strayed into Pakistani-controlled territory Oct. 23, Pakistani troops promptly released the aircraft and its crew and returned them to India, averting a crisis. Earlier this year, the two countries also resumed peace talks scuttled by the 2008 attacks in Mumbai that killed 166 people. 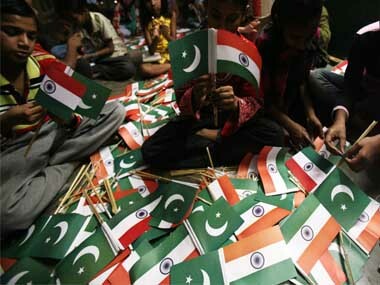 Pakistani militants carried out the attacks, and India has accused Pakistan’s ISI spy agency of involvement in the assault. Both countries are also discussing a deal that would allow Pakistan to import electricity from India to relieve massive power shortages crippling the Muslim nation’s economy. In addition, India didn’t oppose Pakistan’s nonpermanent seat on the United Nations Security Council last month, which passed by a single vote. And, earlier this year, New Delhi didn’t fight a European Union bid to allow duty-free imports of Pakistani textiles, even though it would cost competing Indian textile makers an estimated $1 billion a year in lost sales. Experts warn that major roadblocks still loom. At the top of that list is the divided Himalayan region of Kashmir, claimed by both countries and the cause of two wars since 1947. A dispute over water rights remains unresolved, and New Delhi continues to accuse the ISI of backing militant groups that target India. Particularly significant is the Pakistani military’s decision to endorse granting MFN status to India. Foreign policy remains the purview of Pakistan’s security establishment, especially when it comes to the country historically regarded by the military as its chief enemy. The military’s backing of MFN status for India, Hilaly said, likely represents a realization that an easing of tensions with New Delhi may now be in Pakistan’s best interests, particularly at a time when relations with Washington and Kabul have soured. Both the U.S. and Afghanistan assert that their efforts to battle Afghan Taliban insurgents have been hampered by Pakistan’s backing of the insurgency there, a charge that Islamabad denies. With trade normalization, experts estimate two-way trade could triple to $8 billion within five years. Official trade flows currently run nearly 7 to 1 in New Delhi’s favor, with Indian exports to Pakistan totaling about $2.33 billion versus $332 million in the other direction. 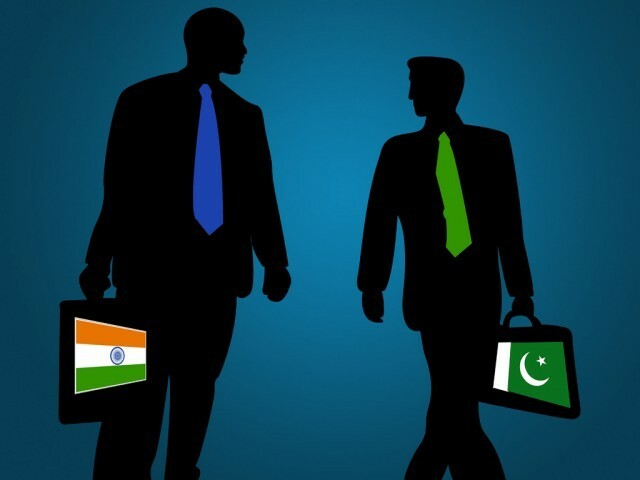 Business leaders from India and Pakistan say there’s new optimism about the efforts their governments are making to improve trade ties. But critics warn that overcoming decades of mistrust may not be that easy. For the first time in 35 years, a Pakistani commerce minister led a business delegation to India last week. The entourage included nearly 80 leading industrialists, traders and high-ranking officials. 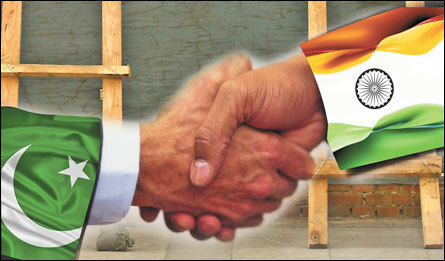 Peace talks between the two nuclear-armed neighbours broke down in 2008 after the attacks in the Indian city of Mumbai, which India blamed on Pakistan-based militants. 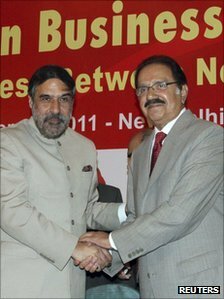 Nearly three years on, as if to emphasise a sense of normalcy, the Pakistani Commerce Minister, Makhdoom Amin Fahim, stayed at the city’s Taj Mahal Hotel – which was one of the main targets of the 2008 attacks. There, leading Pakistani traders got a chance to mingle with their equally eager-for-business Indian counterparts. Between them, they spoke not just of the profits their individual businesses could make if their governments removed the long standing hurdles in their way. But also of how much the people of their two countries, and indeed the wider region, stand to benefit from freer movement of goods, money and commodities. Vijay Kalantri, president of All India Association of Industries, said traders on both sides feel business between India and Pakistan is a win-win situation for everyone. “Why are Indians and Pakistanis forced to trade unofficially via third countries like Dubai or Sri Lanka?” he tells the BBC from Mumbai. After the talks in Delhi, ministers from the two sides announced their agreement to boost their annual bilateral trade from current $2.7bn (£1.7bn) to $6bn by 2015. They also pledged to ease business travel and promote bilateral trade through the land route. 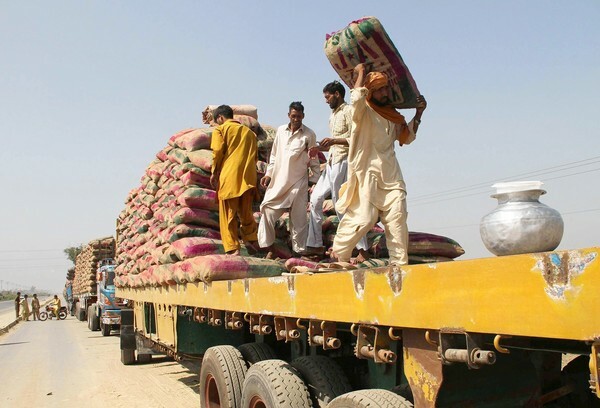 For Pakistan, a significant announcement was a pledge by India to drop its opposition to the European Union’s plan to grant Pakistan tariff waiver on select commodities to help it recover from the devastation of 2010 floods. There was hope that Pakistan might reciprocate and grant India the Most Favoured Nation status (India granted Pakistan MFN status way back in the 1990s). Even though no such announcement came, Pakistan committed itself to a road map to implement preferential trade ties with India, as prescribed under the South Asia Free Trade Agreement (Safta). There are a number of explanations why Pakistan has so far withheld the MFN status from India. First is political. Pakistani leaders have often linked it to the resolution of the core issue of Kashmir. It’s a stance which has long been propagated for mainly domestic consumption. But there is a sense in Pakistan that while the country should continue to push for a negotiated settlement of the Kashmir issue, trade and commerce should not be held hostage to resolution of political disputes. The second is protectionism. For years, domestic industry in Pakistan has feared it would be swamped by imports from India. But even there, the mood appears to have shifted. Senator Haji Ghulam Ali, president of Federation of Pakistan Chambers of Commerce and Industry, says there’s a consensus that Pakistan should open up to Indian business. “Everyone now recognises it will be beneficial for both sides. It’s just a matter of time before it’s done,” he tells the BBC from Delhi. Business leaders say that less trade barriers would benefit firms in both countries, However, the last, and more plausible, obstacle is the issue of non-tariff barriers. “In my experience, India has one of the most restrictive trade regimes in the region,” asserts Dr Ashfaq Hasan Khan, a former advisor to Pakistan’s Ministry of Finance. His view matters, given has decades of dealings with South Asian governments on trade liberalization. He explains that despite granting Pakistan the MFN status, India has a variety of non-tariff barriers in place – such as, stringent certification codes, customs rules, security clearances and movement restrictions – which make it virtually impossible for Pakistani traders to do business in India. “The only way I see realisation of trade potential between our two countries is for India to remove its non-tariff trade barriers and for Pakistan to reciprocate by granting the MFN status to India,” says Mr Khan.